The application that we are scoping will serves a Classified Marketplace Website to connect buyer and seller with each other. Seller can create their personal store for offering their product on auction over website and send request to admin, once admin will verify the seller's request then store will show over website. They will be able to add products to their store such as properties to lend, buy, excursions offers etc. over website. Buyer can search products on the basis of category and can view the product listing over website. They will be able to apply filters them by Long lets min/max monthly price, area, number of rooms etc. and can also sort by price, date etc.. Buyer can search product for auction and view details of selected product and can add into cart option. They can proceed to checkout and make payment via integrated PayPal, Skrill payment gateway and also from credit card, bank transfer. 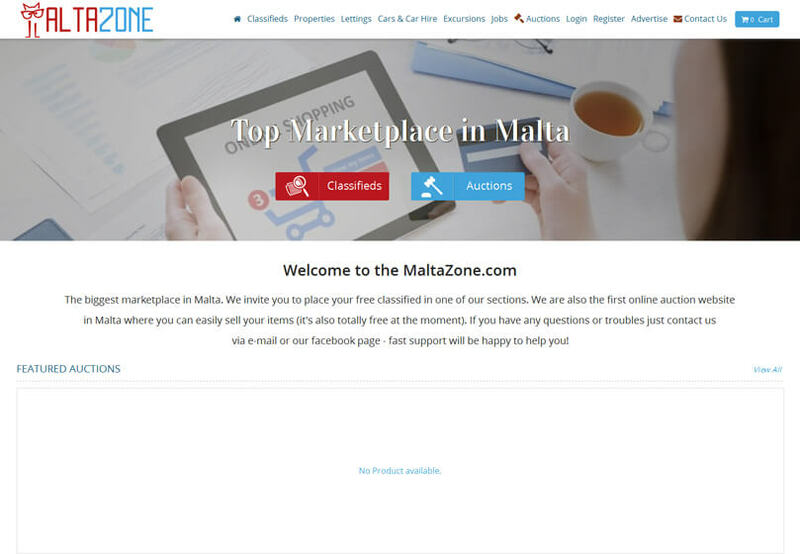 Maltazone has chosen us for our ability to develop complex sites and providing efficient solutions with logical approach to the requirements. The sites has only single version that is running successfully from the date it was released. The motto of the proposed site solution is that Seller can create their personal store for offering their product on auction and send request to admin, once admin will verify the seller's request then store will show. They will be able to add products to their store such as properties to lend, buy, excursions offers etc. Buyer can search product for auction and view details of selected product and can add into cart option.